Last week we saw Imagination Technologies (IMG) and its shareholders hit hard as Apple indicated that it wouldn't be licensing Imagination's GPU IP in upcoming device designs. IMG relies upon Apple for half of its income, so as the news broke its shares nosedived, settling at a price below half their value compared to the previous trading day. In a statement published on that terrible day for Imagination Technologies, you could read of the disbelief that Apple could design a brand new GPU architecture without infringing on IMG's intellectual property rights. Imagination Technologies has been licensing its GPU technology to Apple for a decade and has been raking in upwards of £60 million per annum from Apple's royalty payments. However, Apple indicated that it wants 'more control' over its products by using in-house technology for graphic processing. This weekend The Daily Telegraph noted that "just days after pulling the plug on Imagination Technologies," Apple has embarked upon a GPU engineer hiring spree for its 'UK design centre'. Around a dozen jobs have been posted for graphics architecture design and support, and The Telegraph reckons that "Imagination’s current employees are likely to be a key target". A little bit of LinkedIn profile digging reveals that Apple has hired at least 25 former Imagination staff over the last two years, mainly deployed now at its San Francisco and London offices. Notably, Imagination's former COO, John Metcalfe, was one of those successfully head-hunted 10 months ago. 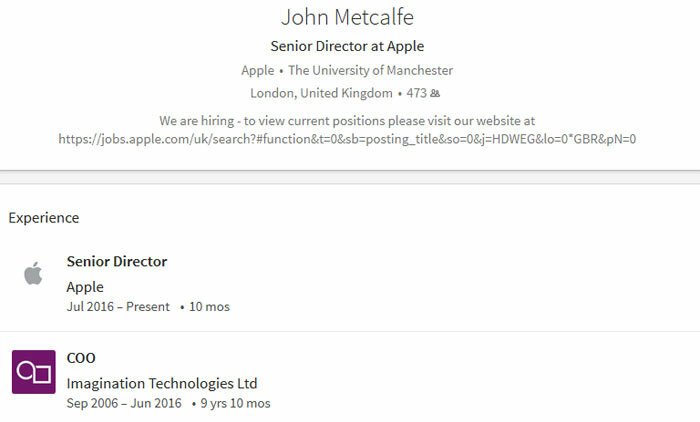 You can see a section of Metcalfe's profile below, in which he highlights that "we are hiring". Apple expects to completely remove any reliance upon (and thus royalty payments for) Imagination Technologies GPU IP within the next two years. There is a seriously scummy company at work here behind the seemingly caring corporate façade.